Organised and run by the FDA and Dods since 2009, the Women into Leadership events are aimed at helping women to reach their career potential through workshops, networking, and advice and tips from speakers in senior roles. 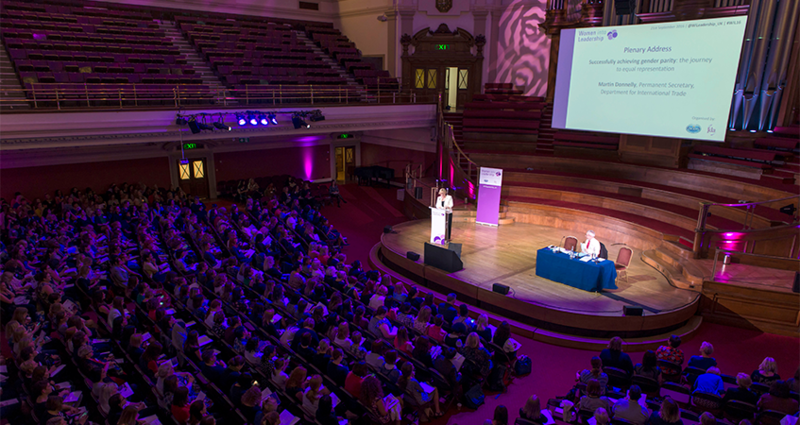 Following a successful event in Edinburgh in May, September saw two further conferences take place; the annual London event and, for the first time, Women into Leadership was held in Leeds. A record 600 delegates attended in London, while the inaugural Leeds event had 150 participants. The conferences were chaired by FDA Vice President Fiona Eadie (pictured above), with delegates hearing from speakers including Permanent Secretaries Leslie Evans (Scottish Government) and Claire Moriarty (Defra), Head of Campaigns and Engagement at the Foreign and Commonwealth Office Ruth Shaw, and Head of Communications at the National Offender Management Service Lisa Appleyard. All of the conferences featured a selection of breakout sessions for delegates to choose from, focusing on a broad range of subjects including embracing technology, public speaking, how to improve networking skills and knowing your worth. FDA and Keystone stands were present at each event, where delegates could learn more about the support, career development and other benefits that the union offers. Speakers from a variety of backgrounds outlined how they reached their leadership roles at the annual London event, including Scottish Government Permanent Secretary Leslie Evans (pictured, right), Head of Campaigns and Engagement at the Foreign and Commonwealth Office Ruth Shaw and Gender Equality Director at Business in the Community Kathryn Nawrockyi. The newly-appointed Permanent Secretary of the Department for International Trade, Martin Donnelly (shown above), also shared how the Business department he recently headed learned to achieve gender parity. Evans spoke about how she “doesn’t buy it” that senior women have not encountered sexism and outlined the importance of challenging things you don’t agree with, adding, “What you permit, you promote”. She added that “developing a thick skin without, I hope, becoming insensitive” and “finding ways to build physical and mental resilience” had helped her to reach Permanent Secretary level. Donnelly told delegates that “leadership is about teamwork, which requires trust, which requires openness about who you are”. Outlining the importance of self-belief, Shaw shared how she feels: “It’s not who you are that holds you back, it’s who you think you are”. Nawrockyi showed the tired images used in the media to illustrate women at work, which often focused on young white women frequently in very high heels. She said female senior leaders “should be prepared to be a thorn in people’s side”. Delegates at the inaugural Leeds event – the first to be held outside of a UK capital city – heard from speakers including the Defra Permanent Secretary Clare Moriarty, Wakefield Council Chief Executive Joanne Roney and journalist and women’s advocate, Harriet Minter. The day also included a panel discussion on recognising and promoting female leaders from outside of London, featuring Head of the Home Office Wales Team and departmental Women’s Network Chair Joanne Hopkins, DWP HR Director for Operations Lorraine Jainudeen, and Head of the Network Support Office at the Valuation Office Agency, Sarah Hinchcliffe. Moriarty told delegates that “being a leader isn’t a niche skill, most of it is about the nudge and push needed to get people to see what they can do”. Roney advised those attending the conference to “be true to yourself and have confidence in your ability to affect change as a leader”. Journalist Minter (shown above), who set up the Guardian’s Women in Leadership section, shared the words “of a wise colleague: when in doubt, proceed until apprehended”. For information about the Women into Leadership events, visit www.womenintoleadership.co.uk.